Today ONLY Save 30% on Decanters for Father's Day $41.99 - $83.99. -LOVE IT OR YOUR MONEY BACK AND LIFETIME WARRANTY - Everyone who gets our patent pending set as a gift absolutely loves it! But if you don't like it for any reason simply contact us for a full refund. -ARTISAN CRAFTED - This elegant decanter is entirely hand made. From the hand crafted wood stand to the hand-blown and etched glass globe &amp; internal ship to the wooden base of each matching bar glass - we pay attention to each detail so that each set can display beautifully in your home/bar. 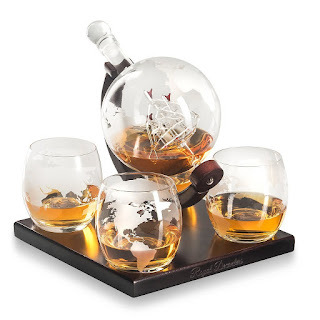 -BAR SUPPLIES SET - With a large decanter &amp; 4 bar glasses this glassware set is a great start or finishing touch for home bars that you can display proudly and serve guests with. Makes a great alcohol related gift for the person who just has everything! -PRESERVES FRESHNESS - A fitted glass stopper seals the decanter for ideal storage, keeping your favorite beverage flavorful and aromatic. Everyone will comment on this tabletop wine holder and display for cozy home decor.